The Hoyo de Monterrey Epicure Especial is a powerful Gordito, 5.6” (141mm) long, of 50 ring gauge, and comes in aluminum tubes in a 50 cigars cabinet. The Hoyo de Monterrey Epicure Especial is a medium to full flavored cigar but medium in body and very smooth with touches of spice. • Epicure Especial is the flagship of the Epicure Line, which includes the Epicure No.1 and No.2 that have made these sizes the leading products of the Hoyo de Monterrey brand. • The communication codes will also be common, since they will all have the same second ring with the name of each commercial size printed on it. 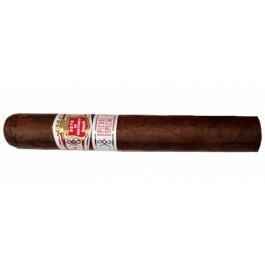 The flavors are not typical Hoyo, however you can still tell it is Hoyo; rich, dark flavors of espresso, woods, vanilla, cocoa and hints of floral tobacco, very refined and extremely well balanced. The cigar has a beautiful triple cap. The wrapper is very light and silky, similar to a Connecticut Shade and has wonderful aromas of caramel, honey and leather. You also pick up a slight bit of cinnamon in the aroma but it is a mild spice. Oily and soft to the touch, the russet-colored wrapper gives off pre-light aromas of sweet hay and coffee. Strong aromas of earth are present on the foot. The pre-light draw is good. This cigar burns evenly with an easy draw. The cigar begins by showing a lot of earth but with a nice smoky cedar and a creamy presence as well. Also present is dark honey. The cigar is very mild in body. There is some cardamom and cumin present. As the cigar progresses into the second third it takes on some floral notes along with leather, but also picks up the honey and cream that was present in the first third. In the final third the cigar becomes much richer with wonderful notes of chocolate and cinnamon, but it still shows mostly oak, cedar and floral flavors to it. The cigar ends medium in body. A surprisingly mild smoke considering the oily wrapper with perfect construction, burn and draw.